Brand new 3 Bedroom/2 Bathroom Upscale Condo. Located on the edge of St. George in Coral Canyon. 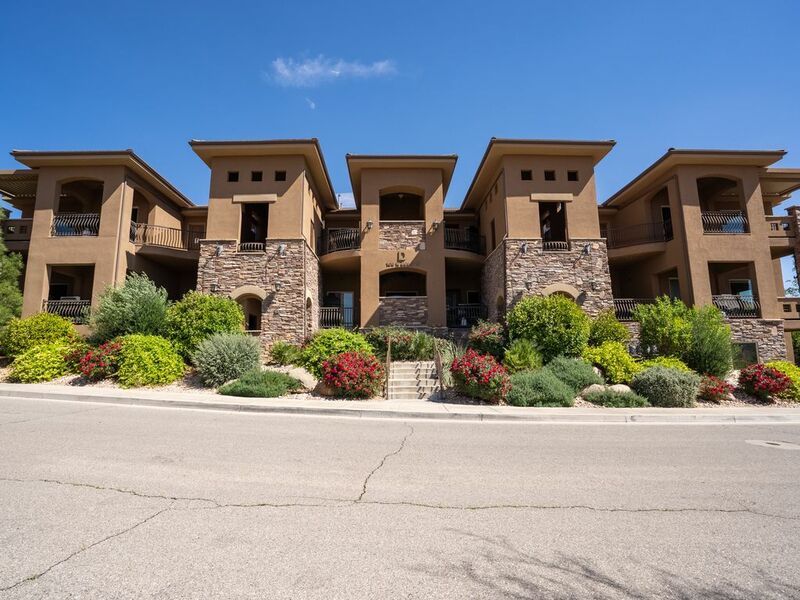 Amenities included are indoor and outdoor pool, hot tub, basketball court, tennis court, picnic area by pool, clubhouse, and golf course nearby. FREE Wireless Internet available in our condo! Condo is upscale with 2 king size beds, 3rd bedroom has 2 twin beds and a trundle bed. Fully stocked kitchen with microwave, coffee maker, dishwasher etc. 3 Large flat screen TV's with 2 DVD players. Granite countertops. Walk in shower and jacuzzi tub in Master bathroom. Central Air and Heating. Outdoor and Indoor gas fireplace. Large Private patio with patio furniture and excellent views. Laundry room in Condo. Underground parking for 2 vehicles, extra parking by front entrance of condo. Close to Zions Park, Sand Hollow, Golf, Rosenbruch Wildlife Museum, Dinosaur Tracks Museum, Fiesta Family Fun Center, ATVs and much more. Vacation Rental Amenities: Indoor and Outdoor Pool, Hot Tub, Basketball Court, Tennis Court, Picnic area by Pool, Excersize Room, Club House, Activities and Attractions, Golf, Hiking, Shopping, Swimming, Water Activities At Sand Hollow, 4 Wheeling/ATV's, Relaxing. Come enjoy home away from home! We had a very nice time staying in the Coral Springs condo. Our daughter, her husband and their three children shared the condo with us plus our other daughter and her little boy. We all fit very comfortably and loved the rooms. The beds are so nice and we all commented on how well we slept. The kitchen is completely outfitted with every convenience. We all loved sitting around the table, playing games and just enjoying a relaxing time. The furnishings are new, very comfortable and the decor is very nice. The location of the condo is close to shopping and restaurants and we loved the pool. We had a great visit! We just wanted to let you know how much we enjoyed staying in your beautiful condo this weekend. We had such a blast. The unit was so comfortable, beautifully decorated, and completely fulfilled our needs. We played tennis and swam, and enjoyed soaking in the outdoor hot tub. It was just a delightful visit all around. Perfect home away from home!! This property is so beautiful and stocked with everything you need to make your vacation wonderful! The pool and workout area are fabulous!! It is in a very quiet location and it is only a few miles down the road from everything in St George. It was really hard to leave this property and had us wishing it was our own! We will def. want to stay there again when we come back to St george!! could improve on. We will be looking forward to next year for some more family fun. I'm sure you will be hearing from us again. We love the St. George area. There is so much to do and see there. It is a great place for a couple getaway or for a family retreat. We decided to buy a place there and share it with others. We love where our condo is located. It is quiet, not very many people know about it yet. So you usually have the place to yourself. It also is close to everything. Within minutes you can be shopping, dining, movies or to the state or national parks. All linens provided with exception of pool towels. Please bring your own beach/pool towels! Laundry Room in unit with front loading washer. Laundry room in unit with front loading dryer. 2 gas fireplaces. One outside on private patio, another fireplace inside in living room. Extra Parking outside of our condo along with 2 assigned spots in the underground parking garage. Underground covered garage - 2 assigned spots available. Fully Stocked kitchen for your convenience. Fully stocked kitchen. Microwave, coffee maker, hand mixer, toaster, waffle maker, all included. Dvd player in living room and in master bedroom. Some DVD's in the condo. Large private deck/patio with patio furniture, BBQ grill, table etc. Gas Fireplace on private patio. Excellent view. Basketball court, tennis court, pools, hot tubs, and clubhouse. Had a great time. Condo was well appointed, clean, and comfortable. Kids in upstairs were stomping on the floor pretty late at night but that is not the fault of our condo owner. Would definitely stay again! Thank you for your great review. I am glad you had a good time and that you enjoyed your stay. We look forward to having you come back! The condo is nice, relaxing and quaint. We had a great time enjoying the sun from the deck, relaxing in the pool, and catching some March Madness games. Even with the WiFi code the service is spotty, the bathrooms were not cleaned before our arrival, and you can hear conversations from the adjoining condos. I am glad you enjoyed your trip overall. I am so sorry that you thought the bathrooms were not cleaned. I talked to my cleaners and they did say they had cleaned them. So I do apologize if there was something they missed. I have not had any other complaints about the cleaners and they are usually spot on. So once again, I am sorry. Next time, please call me right away and I will send the cleaners back over! Our family loved our comfortable stay at this condo for a weekend away! Beautiful and comfortable furnishings. Everything we needed was there. Our only regret was we couldn’t enjoy all the amenities longer as our stay was short! The only downside was my husband was on crutches and the condo was on the 2nd floor. We would definitely stay here again!! The condo was awesome and Karla is wonderful. Could not have been any better. Thank you! I am so glad you enjoyed your stay. I hope you can come back another time! This condo was beautiful, spacious and had absolutely everything here as if we were right at home! The condo was amazing! We loved the indoor and outdoor pools and the sports court. The condo is extremely nice. Very clean and comfortable. We stayed here because we wanted to spend time at Zions which was 35 minutes away. The benefit of staying here is how quiet it is. The drawback is it’s away from all the action if St George and you need to drive to get to everything. If you want a quiet place to relax this is perfect. Geochaching, ghost towns, Zions National Park, etc. Cleaning fee of $85 will be added.